Welcome to this website. My name is Peter Aardoom, I live in the Netherlands and I own a Haldane HD-100 Mk I. In 2013 I did a partial restoration and conversion to LHD. In 2014 I tried to find out the story behind the Haldane cars. Haldane did not stamp serialnumbers on its chassis. However, upon dismantling I found a number on the front crossmember of the chassis (between grille and radiator) in blue paint, number: 008. When I managed to get in contact with founder Brian Harrison I received a lot of photographs from him. Among these photographs there were pictures of chassisnumber 008. 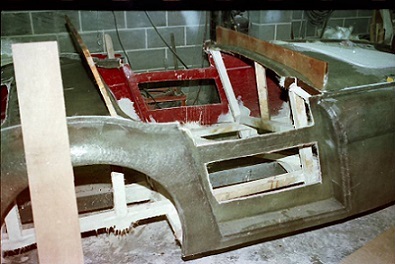 These pictures were taken when this car left the factory as a kit to be delivered to Alexander Anderson. From the pictures I could also conclude that specific damage on the radiator was in the exact same places as on my radiator and I could also trace back the original color of the car when I dismantled the hinges of the doors. My chassis had been galvanised and it is really in a remarkable good condition (no welding needed, wow!). In 2015 the entire suspension has been restored with all new bearings, bushes, brake lines and brake components. On the rear axle the nut on the pinion shaft worked itself loose and locked up the rear wheels while doing 60+ kmph. Dangerous car but fun! 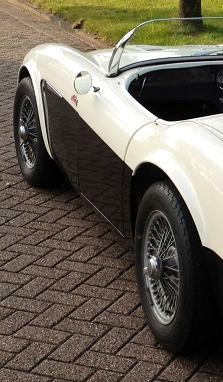 In order to pass the APK (MOT) the wire wheels had to go because the central spinners were too wide for the bodywork. In January 2017 Bryan Johnson, who owns a "Haldane" 100S with an unusual chassis, informed me he had a call from Bob Adams (Bobs Affordable Classics). Bob Adams knew who built his car! It was not Haldane... I called Bob and he gave me the number of Pete Farriesof PCF Motors. 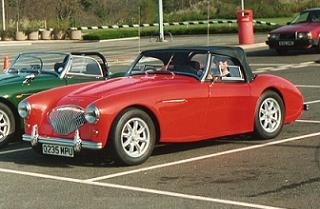 Pete made the moulds for a Healey 100/4 replica, the moulds for a Healey 100s replica and built a number of cars. 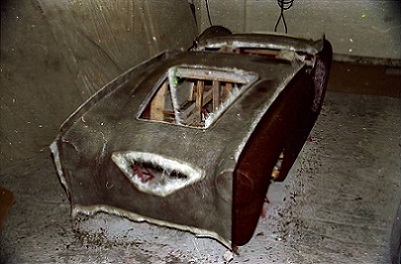 In December 1986 Pete offered the moulds and a body for sale (see "Articles") and eventually sold to Haldane. The origin of Haldane was researched extensively by me and now finally a break through. Pete Farries sent me a number of photographs and this will be the basis for another "History" section. Click here. 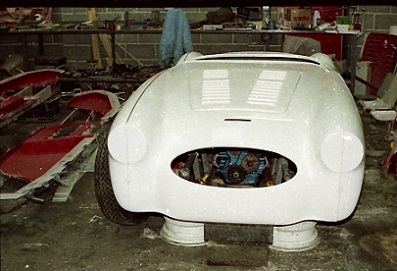 The moulds for the Healey 100/4 formed the basis for Haldane. 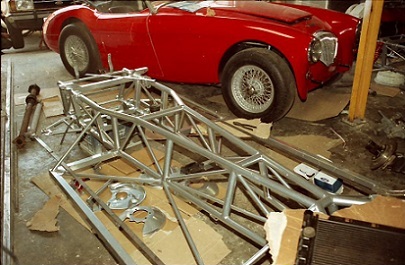 Austin-Healey 100s replica and the chassis. Pete Farries built all sorts of vehicles. 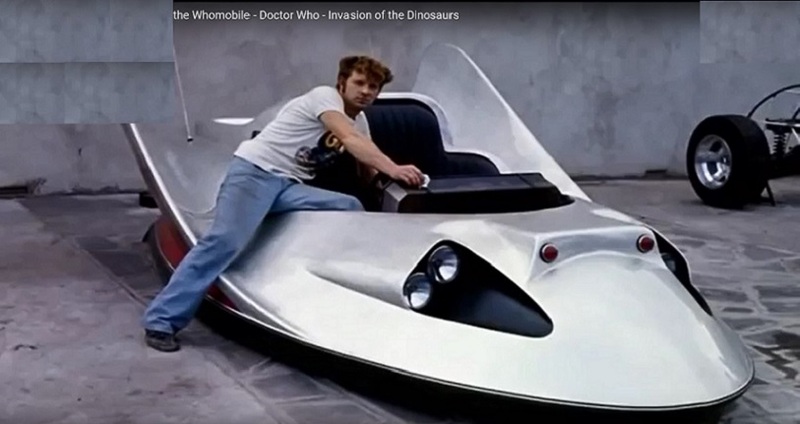 The most famous one being the Dr.Who mobile for Jon Pertwee. An attempt has been made to recreate another replica based on the existing moulds. The project was advertised on several sites and has been sold. Any information regarding this project would be appreciated! A custom made chassis, BMW Z3 suspension and drivetrain, Pilgrim body. Leon Fuller would like to know what happened to the special Haldane he built. It was a Haldane to Works Rally specification. HD300 body on a 100 series chassis and tuned Pinto engine. Send me an e-mail and I will forward. John Prince, owner of a Haldane HD100 has a complete set of bumpers including overriders and brackets, all new. They are for sale. 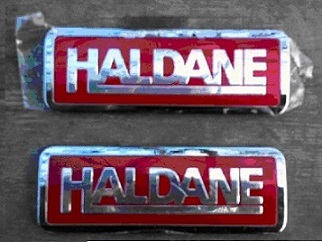 When I wrote down the history of Haldane I received quite some info and a number of Haldane badges from Brian Harrison, founder of Haldane Sportscars. If anyone is interested in a badge please contact me. 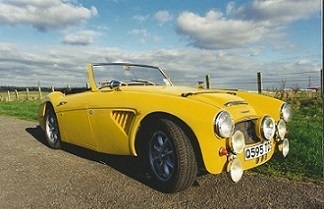 Fred Pickering would like to get in contact with the current owner of the Haldane MkII with registration Q235MPU. Fred originally built this car and would like to see it again. 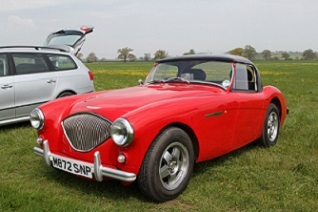 I got a message from Geoff Carter who owns a Woodley Healey. They are built in South Africa, early ones were 100-4 style and later ones 3000 style. Update: 12-Nov-2017 Paul Little driving through English country lanes! Update: 12-Nov-2017 "Register" updated, new pictures from Bernhard Platzer. Update: 22-Aug-2017 "Register" updated, Haldane mk2 for sale on ebay. 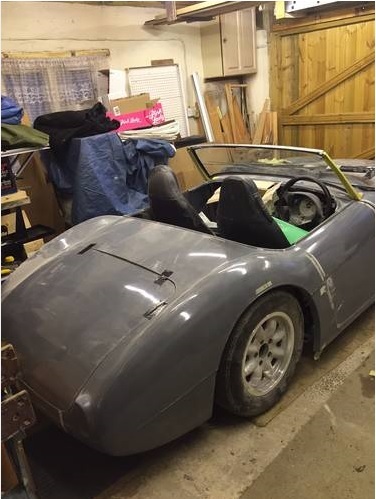 Update: 7-Aug-2017 "Register" updated, an unfinished Haldane Mk1 bought by Martin Boagey. Update: 25-Apr-2017 "Register" updated, thanks to Matthias Wienand. Update: 13-Jan-2017 "Register" updated, another pre-Haldane added. Update: 10-Jan-2017 "Articles" updated, thanks to Pete Farries. Update: 10-Jan-2017 "Register" updated, thanks to Lance Sweeny from the USA. Update: 2-Dec-2016 "Register" updated, Haldane HD300, A902 DPG added. Update: 2-Nov-2016 "Register" updated, Haldane Q595 TDS added by Leon Fuller. Update: 10-Oct-2016 "Register" updated, Haldane for sale on ebay. Update: 22-Apr-2016 "Riley" update, "Register" update thanks to Roger Bell. Update: 8-Mar-2016 "Register" update from Garry Thomson. 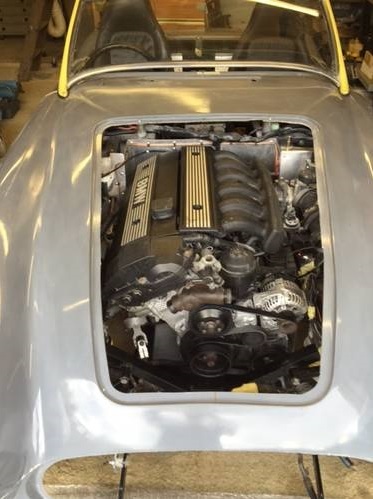 Update: 23-Aug-2015 "MOT" added and "Driving" updated. Update: 4-June-2015 "Register" updated, HD300 and HD100 Mk1 added. Update: 14-Jun-2014 "Register" updated, thanks to Bernhard Platzer: Haldane MkI surfaced in Germany. Update: 13-Apr-2014 "Register" updated, Haldane MkI for sale on ebay (Ireland). Update: 5-Mar-2014 "Register" updated, thanks to Valerian Doyle. Update: 16-Feb-2014 "Register" updated, thanks to Alan Greenwood. Update: 8-Dec-2013 "Register" updated thanks to John Prince. Update: 25-Oct-2013 "Register" updated thanks to Bryan Johnson. Update: 26-Sep-2013 "Register" updated, UHR723Y update and Q769XSC for sale on e-bay. Update: 23-Sep-2013 "Register" updated thanks to Neil Hansen. "Driving" updated. Update: 4-Sep-2013 "History" update, thanks to Brian Harrison. Update: 23-Aug-2013 Huge "Articles" update. Update: 25-July-2013 "Suspension", "Drivetrain" and "Register" added.